Ruth Dresselgn Deneke, Ethiopian, lives a double life. 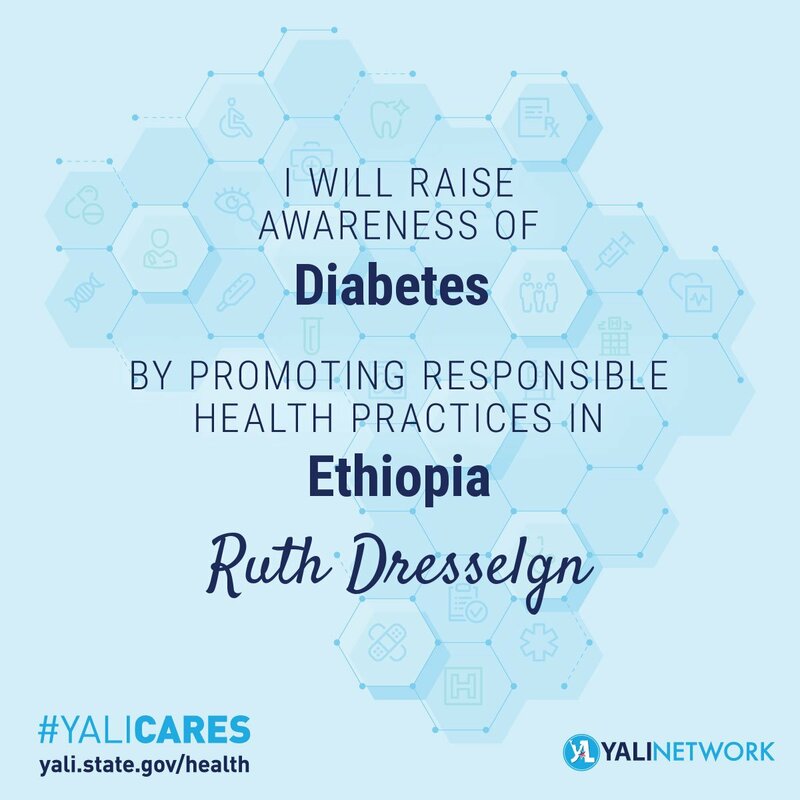 A pharmacist by profession, she has worked with multinationals operating in the pharmaceutical industry to reduce diabetes in her country and in Africa. She is also a woman involved in many associations and clubs, committed for the empowerment of young people. Tell us about yourself, Ruth. Where did your story begin ? My story is a simple one. I was born and raised in Addis Ababa, Ethiopia, amidst upheavals, an unsettled political landscape, economic difficulties, and a people with a strong cultural identity. In all of this, I grew up amongst a defining characteristic of my people: hope. Hopeful youngsters that, despite the obstacles faced post-communist regime, would create ingenious businesses, research disruptive ideas, and most of all work together for a vision of a better future. This hope is what defined my formative years. It drove me to better develop myself and engage with those around me more. It made me believe that I could make an impact by becoming an activist and a pro-active member of my community. It is why I made it my journey to work with youth and empower people through both international and pan-African youth membership organizations. This was made possible because of my schooling at the Indian national school and later school of Tomorrow, which afforded me to be taught in an international language and allowed me to look at the world with a different lens because of the diversity of those around me. That is why I passionately love to travel , experience new places , People from different walk of life, food and culture. After high school I continued my commitment to social causes and chose training that could make an impact. In fact, I gained a Bachelor of Pharmacy (BPharm) at the University of Addis Ababa and became a Pharmacist by training. I then proceeded to engage professionally in the health sector, focusing on Diabetes, Anemia, and Maternal and Child Nutrition. You made your career in the pharmaceutical industry. Why the choice of this sector? I realized, through all the work i did in communities, that impacting society is not all about activism, or trying to change the status quo. Impact can be had working to make systems effective and efficient. Moreover, I realized while at university, that the pharmaceutical sector has repercussions that are life saving. I believe the health of society impacts the socio economy of a country and therefore I wanted to play a role in the health care system one way or another hence why I chose the sector. This is how I committed myself to Maternal and Child Nutrition issues through working for Pfizer and Nestlé. You focused on Diabetes. Is it the reason why you joined Julphar Diabetes? I focused on diabetes when I joined the Gulf Pharmaceutical Industries (Julphar) as the key account for their Diabetes portfolio. Because it is a sensitive sector and requires special attention, I got involved in the sector to ensure access to insulin in the country and work with all actors. I work closely with the governmental body that supplies medicine to the whole country ensuring the required medicines are available and properly distributed. I also have other mandates such as the Anemia portfolio, supply chain and tender management. As I mentione earier, I closely work with the government bodies that offer tenders for the entire county. Health on one hand, young people on the other. Is empowering youth your fight ? Empowering young people has been and is my life’s journey. The African continent has untold potential and resources. One of its riches resource is in fact its youth population. Growing up amongst ingenious and capable youth, that created opportunities in the face of adversity, instilled in me a need to support those that can make a difference. I believe to be a Pan African activist and influencer. I chartered the Rotary club of Arada and it’s Secretary 2017/2018; In addition, I decided to enter in leadership positions in many African CSOs, to influence these towards strong support of youth. To mention a few I lead: Africa 2.0, Africa youth Panel and African Artist peace initiative who are involved with the Agenda 2030 and the global SDGs. I firmly want to play a key role in cultivating this potential of young people and work on human capital to achieve the promise and true potential of Africa’s development. Coming back to Rotary, it is a global network of 1.2 million neighbors, friends, leaders and problem-solvers who see a world where people unite and take action to create lasting change across the globe, in our communities and in ourselves. Rotary club of Addis Ababa Arada is chartered by Senior Rotaractors and friends in 2015 who believed they can impact communities. The members are professional leaders in their sectors and influence through leadership and service to the community. We network with other Rotary and Rotaractor clubs nationally and also globally through exchange programs. Is that the reason why you joined Women in Africa Initiative ?